It’s what every kid wants. It’s what every kid needs. 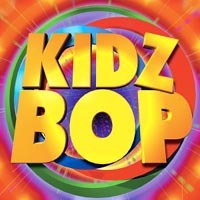 Kidz Bop, thirty newly recorded, kid friendly versions of today’s biggest songs. You can’t get this collection in any store. Your kids can dance to this music all day. These are the songs that kids love. They’re great for parties, driving in the car, or just about anything. You’ll dance, you’ll sing, you’ll go crazy. This is one CD that the kids and you can listen to together. Kidz Bop rocks! With Kidz Bop you’ll never stop!